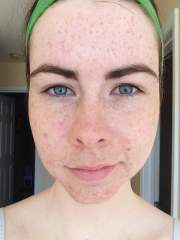 So excited about my Acne.org results! The jojoba oil is great for a once a week facial "masque"
I Still Have Dry And Flaky Skin! Hi again. Have you heard of Perioral Dermatitis (POD skin condition)? I don't know much about it, but I know someone who has it. From what I know, its a condition that causes redness/blotchiness on the skin. The reasons are unknown. But try researching it, and if it sounds like what you are experiencing, talk to a dermatologist. Know Any Salicylic Acid Toners? Have you tried a glycolic acid toner? Gylcolic acid works in a similar way that salicylic does, in that it works by breaking down substances that bond dead skin cells beneath the top layer of skin. Dead skin cells, which contribute to clogged pores and dull skin, can then be rinsed away. My favorite Glycolic acid toner is the one by Mario Badescu. I find it at Ulta Beauty, and it's under $20! I use Wen cleansing conditioner. I stay away from the harsh chemicals, and sulfates which can damage your hair further, especially if you chemically straighten your hair. Also, using a heat protector is very important as well for when you straighten with a hot tool. Wen has a styling creme in their line that is good for heat protecting. Add back shine with oils! Need Help With Minor Acne Scars. Personally, I have really fair sensitive skin, and "redness" shows up really easily, especially around my mouth. Try using a chemical exfoliant! A physical exfoliant (like a scrub) will only cause more irritation and redness. Use a gylcolic acid, I use Mario Badescu Glycolic Acid toner on a cotton pad. It helps with hyper pigmentation and redness. Also, you might have sensitive roseca prone skin, try using calming products for roseca, and drink lots of water! 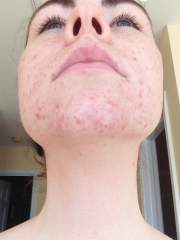 Stubborn Jawline Acne, Spread To Cheeks? This is a very subjective question. Personally, your acne is only as bad as you feel it is. 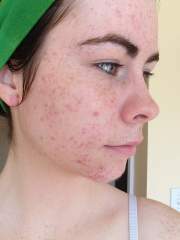 I feel like my acne was/is severe, although some people may disagree. 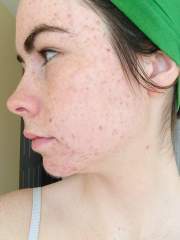 I never had cystic, deep adult acne before until I stopped taking birth control. 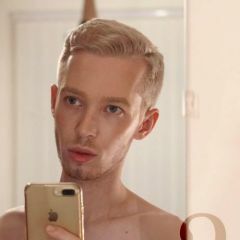 My skin quickly changed and I began breaking out along my hairline, around my mouth and chin and on my jawline. To me, moderate acne is when you have 3 or 4 isolated pimples (highschool years), and severe is when you have large cystic acne (adult acne). I don't know much about your case other than what I've just read, but I thought I'd drop some advice anyway. Maybe it'll be helpful! Have you tried using a AHA exfoliator? Alpha H's Liquid Gold is a great one. It's known for smoothing out those little comedones under the skin. Do some research on it! Also, the ones you get around you eyes are sometimes caused by over moisturized skin (try to avoid added extra moisture and oils to that area).